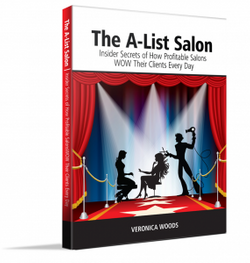 In 2013 the book The A-List Salon: Insider Secrets of How Profitable Salons Wow Their Clients Every Day, was released. I was very honored to be one of the sixteen salon owners featured in the book. The book is written by Veronica Woods, creator of bookyourchairsolid.com. I was asked business questions about creating a salon, hiring, and social media. The book presents a very informative view from several owner standpoints that recognizes every facet of the beauty industry and salon ownership. I highly recommend checking it out if you are a hairstylist, own a salon or plan to own a salon one day. Last October, Veronica Woods interviewed me for her A-List Salon Radio Show. It features a great 30 minute spill on my history in the industry as well as some great business tips for my fellow salon owners.